Did you not include the MyApp Libs folder? @TJ H I have written an Inno Script to provide some of my apps to the Windows community. I got the script compiled and wrapped in my certificate without any errors. However, after installing the app it crashes upon launch with a Runtime error of 990. After installing on what version of Windows ? I ran both vc_redist.x86.exe and vc_redist.x64.exe of the Windows runtime. The 990 error persists. I'll go back and read that pdf doc. I must have missed something. Take a look at the directory it installs into. Double click the Xojo-made executable. If it doesn't run, that means your script is putting files into the wrong place. 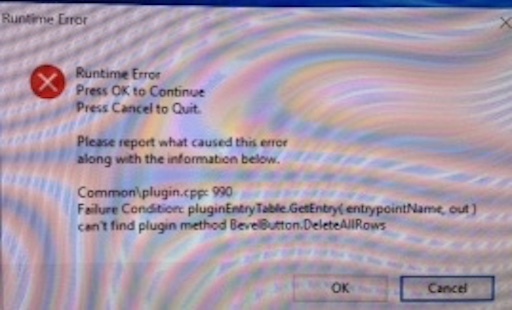 AFAIK, that's the only time you would get a plugin entry error. Show us the line in your innoscript that installs the libs , please. DLLs go into "myapp libs"
I have a screen shot of the runtime error, but can't post it to this forum. You can upload images to imgur.com and then link to them or embed them here. Here is the complete inno script. I'll try to post the runtime error screenshot. You're not installing the Libs and Resources correctly. That was it. Inno setup compiled without errors and I was able to install my app without errors; and it now executes without errors. Thanks to everyone that took the time to look at this problem for me. I never would have solved it by myself. Now I enter the next phase, getting the app up on the Microsoft store.